I liked the format of this devotional: a sweet story about a quilt (and people who make them), then an application to how we can apply a principle taught in the story to our daily walk. Lastly, she included a prayer to help us remember to apply the principle. SUMMARY: Quilters understand with every stitch how God can make even scraps wonderfully new and striking with a little time, imagination, and love. 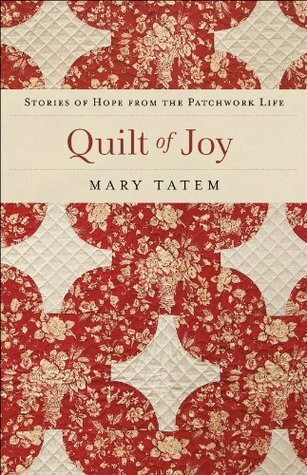 In these touching books, Mary Tatem pieces together spiritual insights and stories of quilters into devotionals that feature some of the most beloved and recognizable quilt patterns in America. Readers will discover the historical background of each pattern and be enchanted by the spiritual reflections on joy, faith, creativity, gratitude, patience, hope, and more. Encouragement, inspiration, and celebration as well as some great stories await readers as they discover that, in God's design, even the smallest scraps or most frayed fragments can be fashioned into something new, complete, comfort giving, and beautiful.REVIEW: This delightful compendium of explanations of a variety of quilt patterns accompanied by several short anecdotes connected to the quilt pattern is a quick, very enjoyable read for both quilters and those who love quilts. I was especially impressed by the gems of wisdom the author included in the summary at the end of each quilt pattern. Very faith filled and encouraging. I used this as part of my devotional time and would recommend it to all.FAVORITE QUOTES: (Just a few as there were so many. )"The ability to look at life with a sense of humor is a skill to covet....Seek friends who know how to look on life with a cheerful attitude. ""Sometimes we can overcome our difficulties by using a new method or finding a new approach to a situation. ""God never hides from us. He hears our pleas for answers and helps us find solutions to our problems." It took me a while to track it down but it was worth it. This book was an easy read with each story being only a couple pages long. So it makes the prefect bedside reader. On those nights that I was really tired, I could read one or two before shutting my eyes. Yes - there is a God/religious/spiritual theme to the book, but overall it didn't have that overly heavy "bible-up-side-the-head" feeling to me. The balance was well done and made for an enjoyable rhythm. The illustrations depicting a quilt in the front of each section was beautifully done by Kevin Ingram. I also found out that this on one of several of her Quilts of series. Which I'm actively searching for by request through Mel-Cat program at my library. With this book I would heartily give it a 5 out a 5 star rating and plan to enjoy more of Mary's books. Thank You Mary for providing a wonderful mix of my 2 favorite past times together and leaving me an overall pleasant feeling and "Joy" that your book provided. I didn't realize this was written to be a devotional. I was expecting real stories about people and quilts, not vignettes written to illustrate a scripture or value. Still, I finished it, skimming over the "devotional" part. The scriptures weren't KJV, so I skimmed them, too, (not as pretty or poetic as the KJV). InspiringLearn a little about quilt patterns, while being inspired by the stories Ms. Tatem associates with them. My favorite was the last one. Was enjoyable, but nothing special. So good, did not want to put it down. finished in one day so good!!! This was a sweet "devotional" book. It is filled with cute, uplifting stories that are centered around quilt patterns.